At a time when industry is thinking about Tata Motors shoddy sales, here comes a spy picture of the Tata Kite compact sedan which was seen testing in Pune. Tata Motors has been testing Kite hatchback for a while and the spy picture of its compact sedan is indeed a very surprise. Tata Motors has been struggling since the Nano problem started. At present, apart from Zest which was recently launched, the company has no model which is getting it good profits. The new Kite platform gives a hope for the ailing company which once dominated the diesel hatchback segment with its Indica car. The spy pictures of Tata Kite compact sedan reveals lots of details about the car. 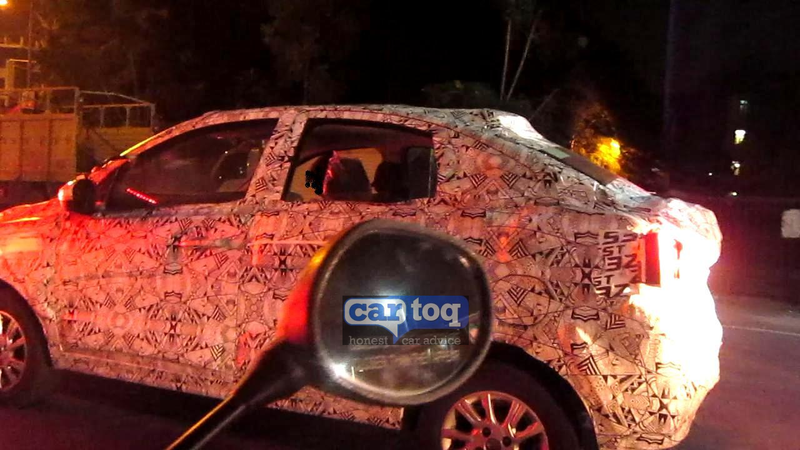 The camouflage tapes with Zest monogram put on the boot is to confuse the people or the tape would have been left over when Tata Zest was being tested and hence used it here. It is clearly seen that the racking C pillar almost eats the boot and the rear tyre is almost at the end giving no overhangs to the car at all. The car looks more coupeish, a good effort by Tata to make its cars more futuristic. The Kite compact sedan is expected to launch after its hatch sibling. Powering both hatch and compact sedans will be 1.2L Revotron petrol engine and new 1.05L 3 cylinder Dicor engine which was showed at a Motor Show earlier this year.